This is the day. I’ve prepped you. We’ve talked it through a few times out loud, as well as, several in my mind. I figured, what the heck. No sense in starting small. Six slabs of baby backs, a couple flat bone racks, two chickens, a pan of charred SPAM/mango (that’s right) beans and a few dozen little numbers that we call BBQ50 Bombs. Take ground sirloin. 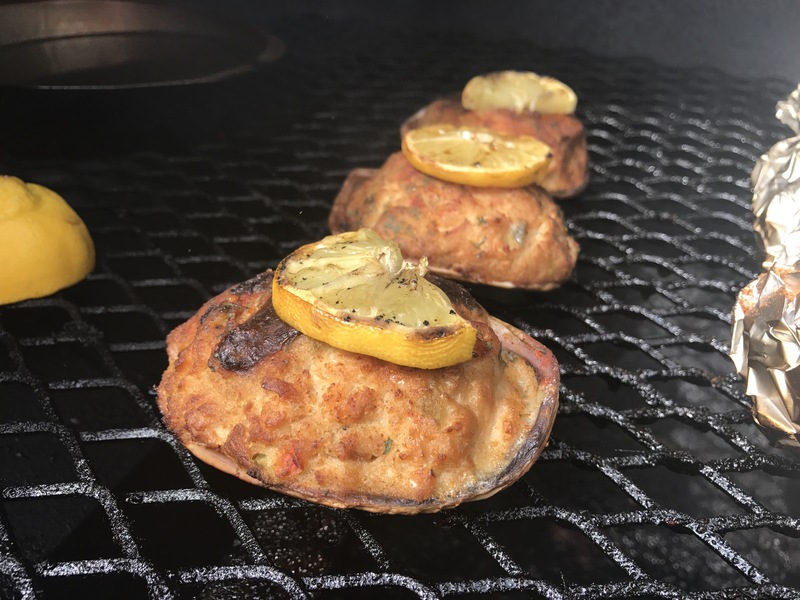 Stuff with maple sausage, jerk sauce, shredded mozzarella and a pickled jalapeño slice and top with Pickapeppa Mango sauce, and three stuffed Atlantic clams. We built a fire out of oak charcoal and pecan logs. I like the pecan because of it’s slower burn and characteristic red hues that it gives the meat. For a change, we added wet cherry to promote smoke. 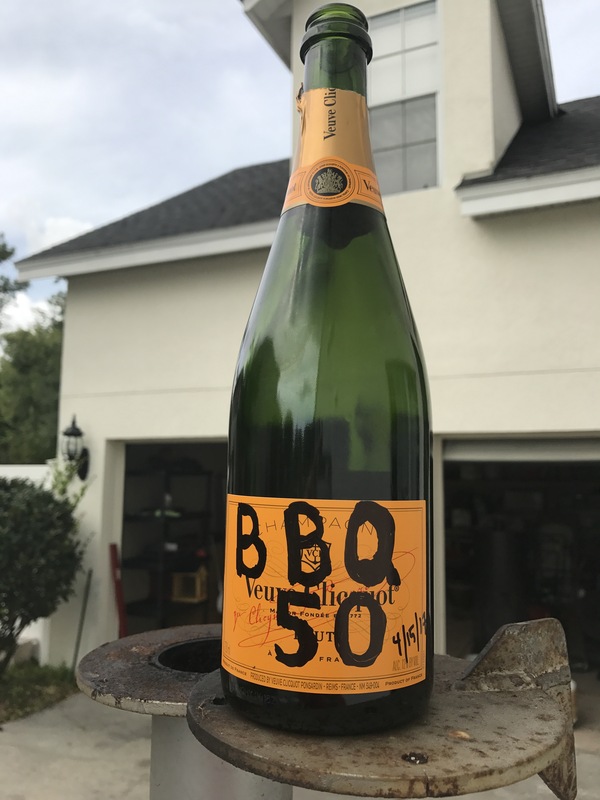 It didn’t take long for this Mother Of All BBQ to get to 300ish degrees. Respect the thickness of the tank. It holds heat. The firebox roars. It reminds me of the fireplace we had in our house growing up. She still used the same amount of wood as I’ve used in past smoking sessions, but it lasted longer. Once we settled to coals, and loaded her belly for the afternoon, it was time to do what we do best…..chill and wait. Sure, you need to stoke the fire. Temp the meat. Add a layer of flavor. All of that goes down. 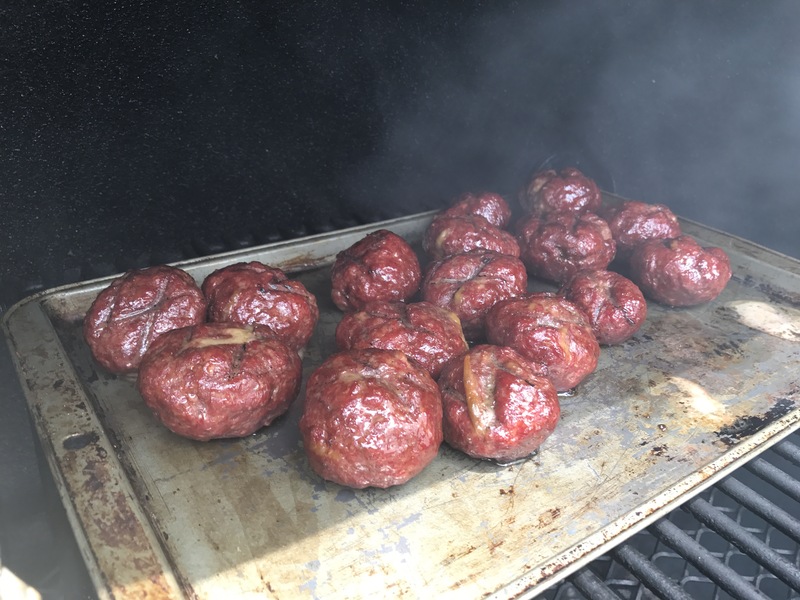 It’s what goes down around the smoker while you are waiting for the prize. I may sound crazy, but, one of my happiest places on earth is in front of the fire. Many can relate to those late night campouts around the camp fire. Lots of thoughts. Not a ton of words….zero if you are by yourself. The game kicks up a few notches when you can find a ghost rider to hang with you for the day. Now you have a soundboard. You have collaboration. If it’s someone new to the game, you can practice your stories that you KNOW you will tell a thousand times to future ghost riders. Lucky for me, my first ghost rider was my sweet everything, Jenny. It’s apprapo that she takes the first lap with me. She is the one that has helped me open my eyes to what’s important in life. Jenny has believed in me and pushed me to follow my dreams. She provides me the support to take chances and do what I believe in. She’s a great co pilot. That’s right…..back to the food. She is an easy, and welcomed, distraction. I learned, quickly, that Miss Felicia doesn’t play around. She isn’t looking for rookies to step up to her plate. I would grade my time with her as a solid B. The spares charred a little more to my liking (note the correction). The baby backs were very juicy with no pull from the bone when tried. 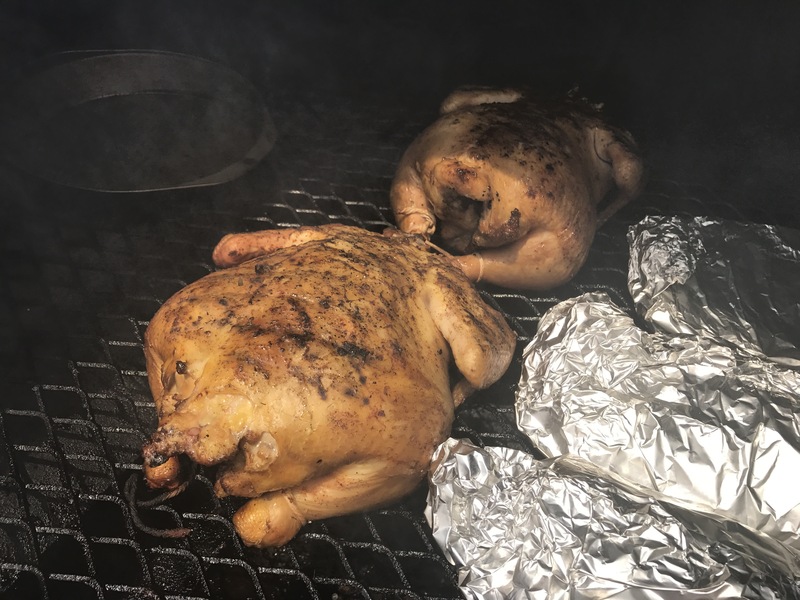 Good smoke on the chicken. Seared over the hot spot in the tank helped hold their moisture. The Bombs were the bomb! A couple eager neighbors rolled by for a sample. They gave knuckles as their stamp of approval. The surprise of the day were the clams! The heat and smoke turned the shell into a small cast iron skillet, crisping the sweet and spicy Walkerswood jerk stuffing. 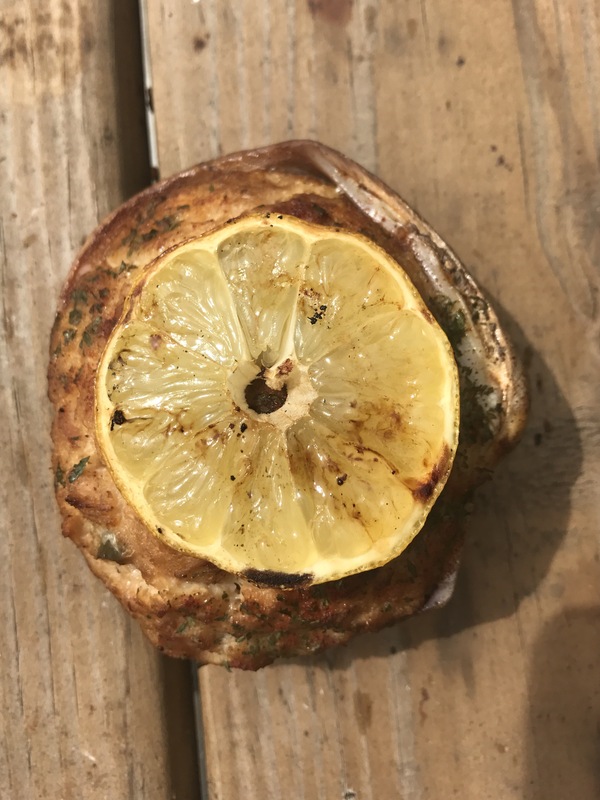 The smoked lemons turned the typical tart wedge into a juicy, melted sweet slice of lemonade…..we will meet again! Her maiden voyage was a success. The first dance was as you would hope it would be…..full of nervous excitement…a little sweat on the brow….a hope and a prayer that you don’t blow it…and a kiss at the end. Speaking of kisses, thanks for being my ghost rider today, Jenny. You make my everything…the only thing.